From Friend Zone to First Dance - Kayla and Mitchell made their MSU engagement session extra personal and so much FUN! Hint: it wasn’t just frisbees that were flying! This day reminded me why I LOVE winter engagement sessions! My first engagement session of 2019 felt like a fairytale! Victoria and Anthony’s walk through the January woods was full of quiet romantic moments, beautiful winter light, and gorgeous shades of green. Tacia and Gabe’s spring engagement session in Birmingham, Alabama revisited all the chapters of their love story, from the campus of Highlands Church to the beautiful lake and wooded hills of Oak Mountain State Park. And this Friday, they’ll start a new chapter as they become Mr. and Mrs. Jaime! We started out on a lake, watched the sunset from a rooftop, and ended the evening hard rock style! Alexis and Jamie's engagement session last November was incredible, y'all! I don't want stress to steal your fun when you are planning your engagement session! So I've written a little blog post about how to prepare your heart (and your sweetheart) to help you both truly enjoy celebrating your love story! I have something special to share with you today! I have a soft spot in my heart for this precious couple, Amanda and Matt, because their love story reminds me just a tiny bit of mine & Jonathan's. Before I met Jon, I had been out of Mississippi exactly three times, and I had never left the South. And before I knew it, we were traveling all over the place, crossing oceans, having adventures, and learning to fly (literally!) My wonderful husband has dragged me kicking and screaming encouraged me out of my comfort zone from the moment we met, and my life is ever so much richer because of his daring spirit. So when we first sat down with these two, I was tickled because Amanda is a lovely, shy young woman - she admitted to bringing her sister along for support on her and Matt's first date! - and she has found her soulmate in a bold, adventure loving, professional pilot. And they've been having adventures ever since! For example: guess where Matt proposed? In PARIS, y'all. PARIS, FRANCE. (Can you tell that he's also very romantic?) And guess what? They're saying "I do" to a lifetime of more adventures this Saturday! Amanda and Matt brought along their sweet fur baby, Bella the bulldog! Look at this FACE! We met Amanda and Matt for their fall e-session in the beautiful small town of Clinton, MS, where Amanda grew up. We were super excited because Clinton is just CUTE, y'all. The little historic downtown has brick streets and adorable shops and BICYCLES everywhere. I loved how they incorporated so many important elements of their lives - their love of small town life, their love of MSU, and Matt's service in the Armed Forces. These things alone would have made for an amazing e-session, but Amanda had a surprise up her sleeve for Matt. After capturing these sweet moments in the charming old streets of Clinton, we drove a few miles out of town... ... where a friend of Amanda's had a private airstrip filled with gorgeous old warbirds! Jonathan and I were over the moon at the chance to even just see these awesome planes, let alone photograph with them! Wouldn't you know it, the weather turned super chilly and windy the moment we stepped foot on the airstrip, but Amanda was a trooper. We had so much fun taking these pictures! Amanda and Matt, we have been so blessed to get to know you and share this part of your wedding journey with you! We can't wait to witness your beautiful day Saturday, and we can't wait to see where love takes you from here! Y'all, I counted 12 different shades of green during my morning walk yesterday! Spring is HERE in Mississippi! 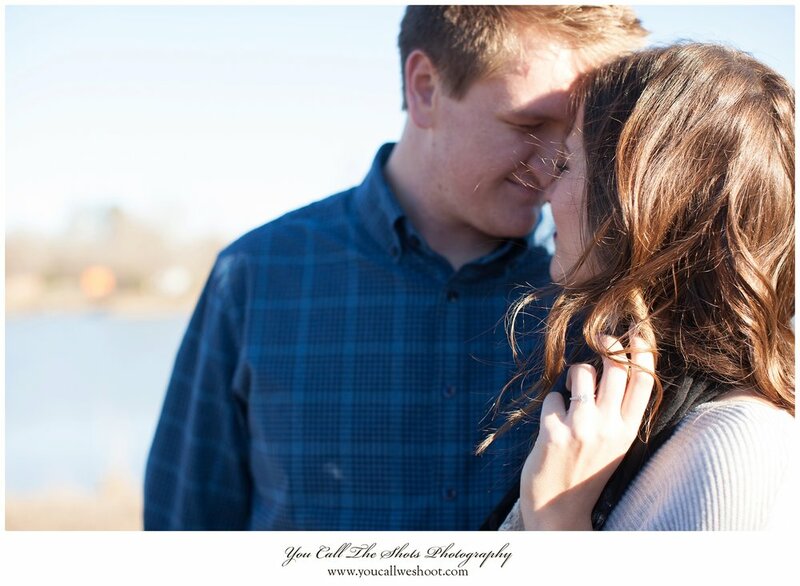 So many sweethearts are planning their e-sessions right now, so I am so excited to feature one of my favorites today. This precious couple, Laura Leigh & Jake, will celebrate their SECOND anniversary this summer - where has the time gone?? Laura Leigh's choice of a soft watercolor palette of light blue, cream, blush, and turquoise complemented the early springtime woods and fields near Plymouth Bluff perfectly. If you want to create a lovely romantic mood to celebrate your engagement, these colors and a sweet patch of springtime woods will make your heart very, very happy. Every time I look at these sweet photos, I remember how much Jonathan and I enjoyed exploring Plymouth Bluff with this precious couple and helping them tell their love story! (And you won't believe the loveliness of their classic Southern summer wedding at The Magnolias in Aberdeen, Mississippi - take a peek here.) Happy engagement and wedding planning, sweet brides and grooms-to-be! Love Is So Beautiful - Happy Valentine's Day!